An update has been provided on how to use the Java EE SE in the latest version of Netbeans. Please go here to read this update. In order to familiarize myself with different JBI components I would like to walk through an example using the JBI JavaEE Service Engine written by Sun. So what is the JavaEE Service Engine? It's a highly useful JBI component providing a bridge between the web container (glassfish) and the JBI container (OpenESB), or more specifically the NMR (Normalized Message Router). It's useful because it allows EJBs and Servlets, packaged as web services, to communicate directly with JBI components and vic versa. Consequently, this increases performance since the request/response doesn't have to travel in and out of the HTTP BC and the glassfish Servlet container. So if you are writing EJB 3.0 web services, you have alot to gain by using BPEL and JBI in general, and you need to look into using the JavaEE SE. The following is a simple example of how to use it. http client --> inbound HTTP BC --> BPEL SE --> outbound HTTP BC --> Glassfish Servlet Container --> invoke Hello web service --> response. Since this post is pretty popular I have an update since this post doesn't work with the latest version OpenESB+Netbeans. Not only do you have to remove the line as described above, but you also need to remove the SOAP Port, otherwise you will receive an "java.net.BindException: Already bound: 8080". So in the image above highlight and delete the HelloPort. Also in newer versions of Netbeans access to the CASA file is done by double clicking on the Service Assembly file under your Composite Application project. http client --> inbound HTTP BC --> BPEL SE --> JavaEE SE --> invoke Hello web service --> response. It should be obvious where the performance improvement is located. That is what makes the JavaEE SE so powerful. For convenenice, here is the final netbeans Composite Application project with the modified casa file. If you are curious to know what netbeans was doing under the covers for us when creating the EJB Module Service Unit here is a quick explanation. In netbeans and File view you can expand the build directory under HelloBPELCompositeApp. Next expand the Hello.jar service unit. There you will see the jbi.xml and an empty sun-resources.xml. The jbi.xml file defines the endpoints the JavaEE SE must activate. These endpoints will be used by the BPEL SE consumer endpoint. Also interesting is it includes a binary of the Hello Service (Hello.class). Just a quick note that after adding the EJB module as a JBI module to the Composite App, I had to clean and build to get the CASA editor to be able to generate the WSDL port to expose for the BPEL module to consume. Seem to be confused with a missing link, how to connect EJB Web Service to BPEL in order to use an assign. 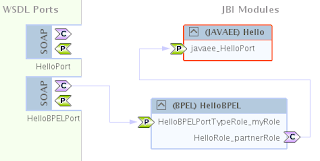 Want to translate EJB to HL7 output via BPEL. Just some step I'm missing.